Here's the thing, I have got half a pan of leftover ingredients from making the Bacon Pastina and Cheese Gratin that I need to finish off. I was thinking of making creamy pasta soup with it, but then I bought some bell peppers on marked down price. Probably won't be the best choice for salad but they would be great for roasting. And that's what brought me to making this: Bacon Pastina Bake in Bell Peppers. The preparation was almost nothing, as I already have the pre-cooked filling ingredient - bacon pastina creamy mix, except for taking it out of the fridge to leave it to room temperature. 1. Slice the top off each bell pepper, clean out the seeds, rinse then dry. 2. 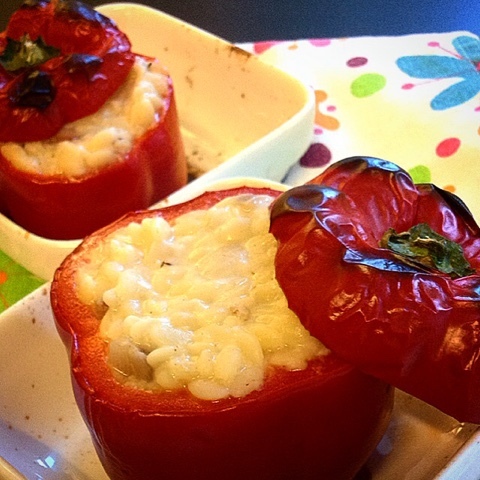 Scoop the bacon pastina filling into each bell pepper, till just over the rim. 3. Place the top back on each pepper, and bake in the oven at 180ºC for about 25 minutes. I made 2 of these, and they are enough to serve 2 people, with some garlic bread and coleslaw on the side. Now I'm almost done with the remaining ingredient, but there's still some left that's probably enough to make another small portion of Bacon Pastina and Cheese Gratin for tomorrow's lunch.